The Gibson cocktail is a classic combination of gin and vermouth. It’s most commonly complimented with a pickled onion, something we don’t see too often in cocktails. Place 2-3 ice cubes in a Boston shaker or equivalent cocktail shaker. Add 2 1/2 ounces of gin. Add 1/2 ounce of dry vermouth. 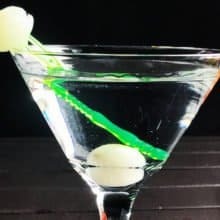 Pour into a Martini glass and add a pickled onion as pictured.